Extreme Events. Heavy Rainfall. Widespread droughts and desertification. Mile wide twisters. Category 5 Hurricanes. According to Tim Flannery’s The Weather Makers this is what the weather of the future will be like. And why? Because of climate change, because of the harsh impact humans have on the sensitive planet. The book is divided into 5 sections: Gaia’s tools, One in Ten Thousand, The Science of Prediction, People in Greenhouses and The Solution. Personally, sections 3, The Science of Prediction, and 5, The Solution, were my favourite. Unless you’re a science or climate geek (like myself) the book can seem a little dry, but it is possible to read a section and put it down while you entertain yourself with something a little lighter. I read the 2005 edition and from what I can tell online the book has not been updated. That’s not to say it’s out of date; the information presented is still relevant. 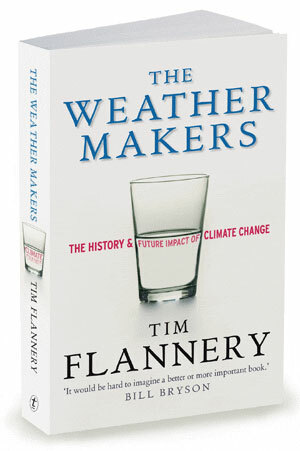 I recommend this book to the climate enthusiast and the climate rookie; there is something for everybody in it.